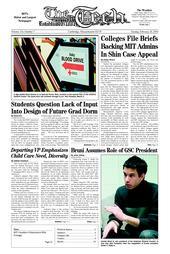 Backed by prominent colleges and educational organizations from across the state and nation, two MIT administrators filed a petition Friday in Massachusetts Appeals Court asking for the dismissal of charges against them in a lawsuit filed by the parents of Elizabeth H. Shin ’02, who committed suicide in 2000 while at MIT. Two weeks after MIT announced its plan to build a new graduate dormitory to replace Ashdown House, students and housemasters are expressing dismay at the lack of transparency during the administration’s decision-making process. Following Emilie F. Slaby G’s resignation last week from the position of Graduate Student Council president, Sylvain Bruni G has assumed her duties in addition to his existing ones as GSC vice president. Bruni will occupy both positions until the 2006–2007 GSC officers are elected and take office in May, in accordance with normal procedure. After seven years as Vice President for Human Resources, Laura Avakian will retire in May, leaving her successor with the challenges of managing MIT’s close to 15,000 employees. MIT is considering entering into science and technology cooperation with the nation of Portugal, but has not made any final decisions regarding the issue, said Chancellor Phillip L. Clay PhD ’75. The Pentagon is staking $3 million on a small team of students at the MIT to help the military identify new ways of disarming the kind of homemade bombs that insurgents are using to kill and maim U.S. troops in Iraq, according to Defense Department documents and researchers.